I found the recipe in some page-shredded, coverless magazine while I’ve been sitting around waiting on Jane’s medical results. The fact that every other recipe in the periodical had been lifted – save this one – really should have been a tell. To be honest, it was quite stunning when it came out of the oven…. For all intents and purposes, it’s lemon flavored Jiffy Cornbread. Deflated, I put the cake cover on it and ignored it. So, with the outlook that every disaster is an opportunity in disguise, I drug the cake back out today and went looking for inspiration. 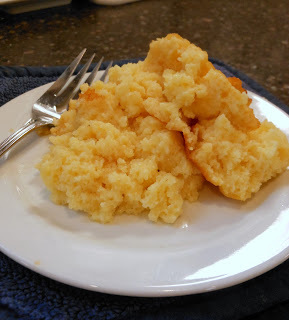 What I came up with was Spoon Bread… … … … .. . . . . . . . . . .
Granted, Southern Spoon Bread is typically (well, in my family) savory. But what the hell. I’ve got 2 cups of unusable cornmeal and a half cup of laboriously squeezed Meyer Lemon Juice already in there – I can’t make it any worse. It turned out, well… outstanding. It’s a light, pudding-ish, spoon bready kind of thing. I danced around the kitchen, ate 3 big bowls of it, and wrenched my elbow patting myself on the back repeatedly. Unfortunately, that little bit of genius only created another problem – how am I ever going to make this again? After a couple of trial and errors – It turns out that Jiffy Cornbread Mix IS the perfect substitute. And on the upside, this give you something to do with the 33 cent box o’ Jiffy your spouse brought home when you asked them you get you some cornmeal. Now THAT looks good. Sadly, I tossed what remained of the savory loaf. It had a really obnoxious amount of pepper in it. But on the subject of substitutions, I make a buttermilk cornbread stuffing on thanksgiving – or did until I discovered Trader Joe’s cornbread mix. Easy and delicious and by the time it’s made into stuffing, no one knows it’s out of a box. The Child loves the stuff. I LOVE things like this – breathing new life into something! I think both look wonderful though! I've had spoon breads before, but nothing with lemon! YUM!!! 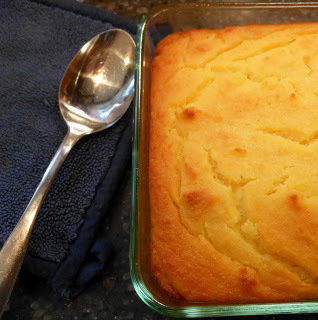 I feel so out of it – I have never had spoon bread – savory or sweet. But the combination of cornbread and meyer lemons sing to me. 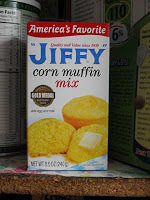 I love jiffy mix and this looks so delish.